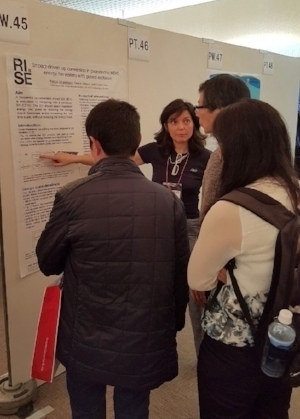 Cristina Rusu presented RISE Acreo's work. 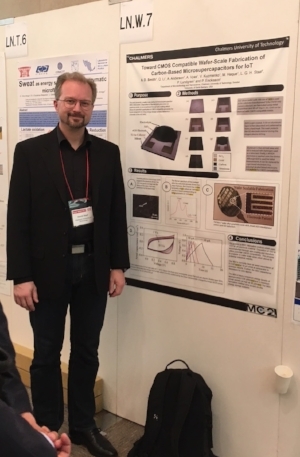 smart-MEMPHIS partners RISE Acreo AB (Sensors System group) and Chalmers University of Technology (Micro and Nanosystems group) presented their scientific results on energy harvesting design challenges and supercap through peer-reviewed posters at the 17th PowerMEMS conference in Kanazawa, Japan, November 14-17, 2017 (see the titles of the posters below). PowerMEMS is an annual conference on micro and nanotechnology for power generation and energy conversion. It is largely academically oriented and has a highly international profile with Japan, the US, Germany, France, China, and the UK among the main contributing countries. Our contributions were well received, forming a part of the effort to understand the behavior of kinetic harvesters and improve their design in terms of e.g. up-conversion, broader frequency sensitivity, non-linearities and energy losses. These, among other related hot topics regarding kinetic harvesting, were also addressed at the conference by several other oral and poster presentations. Other focus areas of the conference were material development for thermoelectrical harvesters, electrostatic harvesting and electret development, piezo- and ferroelectric harvesters as well as power electronics design. Henrik Staaf presented Chalmers' work on Toward CMOS compatible wafer-scale fabrication of carbon-based microsupercapacitors for IOT. Shape effects in doubly clamped bridge structures at large deflections, F. Ohlsson, P. Johannisson, C. Rusu. Toward CMOS compatible wafer-scale fabrication of carbon-based microsupercapacitors for IOT, A.D. Smith, Q. Li, A. Anderson, A Vyas, V. Kuzmenko, M. Haque, L.G.H. Staaf, P. Lundgren, P. Enoksson. Posted on December 12, 2017 by Erika Forstén. On Friday afternoon June 9th both me and Cristina R will be in the PhD “jury” (betygsnämnd) for a PhD defence by KTH PhD student Janko Katic. His thesis is entitled “Highly-Efficient Energy Harvesting Interfaces for Implantable Biosensors” (identical topic as WP4 in smart-MEMPHIS). Posted on June 8, 2017 by Johanna Anteroinen. "Var vi än befinner oss omges vi av energi som skulle kunna driva små elektriska apparater och sensorer. Utmaningen är att fånga in den. Nu utvecklar svenska forskare en pacemaker som ska drivas av hjärtats egna slag." Posted on May 29, 2017 by Johanna Anteroinen. Posted on February 13, 2017 by Johanna Anteroinen. Two master thesis presentations were held on November 9th 2016 at Silex in Järfälla during the largest Stockholm November snowstorm in 100 years. Left: Jesper- respondent, middle: Hans Sohlström (KTH -MST as examination) and right: Mikael as opponent. Mikael Granberg presented his thesis "Investigation of Methods to Improve PZT Sol-Gel Deposition Process for Energy Harvesting Applications"
The purpose of this work was to investigate ways to modify Silex sol-gel deposition of PZT (PbZrxTi(1-x)O3, Lead Zirconate Titanate) to improve its properties for energy harvesting applications. A number of methods to improve the figure of merit for energy harvesting (FOM= e312/ε), cause self-polarization, increase lifetime, reduce cost, increase throughput or simplify processing were tested. In order to create a barrier preventing lead diffusion into the substrate, a method to oxidize the bottom electrode’s Ti adhesion layer into TiO2 by RTA (Rapid Thermal Anneal) was tested. Oxidation was successfully achieved and was found to aid in self-polarization, thereby increasing the FOM for films without post-processing polarization. An extended lifetime is expected, but has not yet been confirmed by testing. A seed layer of a different material was tested and compared to a PZT-based seed layer. The new seed layer was found to give highly (100) crystalline PZT with improved self-polarized e31,f and FOM. The new seed layer was also found to be less sensitive to processing variations. Oxygen control during crystallization of the PZT was used in an attempt to generate PZT layers with oxygen vacancies. These hypoxic layers were intended to polarize the film, but were found to reduce the FOM and lead to partial delamination of the film due to stress. A different type of PZT sol-gel was tested as an alternative to the PZT sol-gel in use at Silex. The tested solution was found to result in PZT films with similar properties to those generated by the original type, but the tested type allowed for single layer thicknesses nearly three times thicker than the original type, thereby increasing the throughput and reducing manufacturing costs. Jesper Scott-Robbert presented his thesis "Fabrication and Characterization of doped thin film PZT"
Piezoelectric MEMS is used to fabricate a wide variation of sensing and actuating devises. The most common piezoelectric material for MEMS is PZT which has been intensively investigated. In order to improve the performance of PZT and create materials optimized for specific applications, altered versions of PZT are being investigated. One way to alter the behavior of PZT is to introduce dopants. In this work, doped and non-doped PZT films have been fabricated using the sol-gel deposition process and the e31,f value of these films has been measured. Two types of dopants have been used to see if these dopants could boost the e31,f value making the film more suitable for energy harvesting applications. Furthermore, processes alteration has been performed to increase the quality and throughput of the PZT film fabricated at Silex Microsystems. The quality of the film could be seen by inspecting the level of non-uniform areas in regards to color and clarity of the film. The quality was improved and the color and clarity uniformity across the wafer was visibly improved. The throughput of the PZT deposition process was increased by ~33% by finding an alternative process requiring fewer crystallization steps. One type of dopant gives an e31 increase of ~12% compared to the highest e31 value previously obtained at Silex Microsystems using non-doped PZT. Posted on December 13, 2016 by Johanna Anteroinen. Piezoelectric material lead-zirconate-titanate (PZT) is the heart of the smart-MEMPHIS project. During the first year-and-a-half, MEMS foundry Silex has reached world-class figure of merit results with a repeatable and improved PZT process. Crystal structure of PZT: Ti and Zr ions in the centre of the perovskite unit displace, creating polarisation and thus electric field. During the first year and a half, one task in the focus of the project coordinator Silex has been the development of beyond state of the art piezoelectric materials. Piezoelectric materials respond to mechanical stress by producing an electric field - or vice versa, contracting when a voltage is applied. Traditionally piezoelectric materials have been used for instance in ultrasound imaging, where they and detect the reflected ultrasonic waves. In MEMS applications in particular, thin-film (< 0.5-10 µm) piezomaterials in particular have recently attracted more attention. This is because they offer more sensitivity and in actuating applications require lower power levels. They also hold promise for more cost-effective solutions. PZT and aluminium nitride are the two most common thin-film piezo materials. The challenge that also smart-MEMPHIS answers has been to mass-produce high quality piezoelectric thin films repeatably and reliably. In smart-MEMPHIS, PZT was chosen for its high electromechanical coupling factor e31, which describes how effectively the piezoelectric material converts mechanical energy to electrical energy (and vice versa). In energy harvesting, the higher the electromechanical coupling, the better. Silex has been able to improve the electromechanical coupling factor e31 to world-class figures better than -19 C/m2. Crystallographic properties of the PZT layer - the crystal orientation - affect the coupling factor dramatically. PZT with a <100> crystal orientation (think looking at a cube of atoms straight ahead) has a 20 % higher coupling factor than <111>-oriented PZT (looking at a cube from one of the corners). The objective of Silex has then been to grow <100>-oriented PZT on top of silicon, on which PZT typically grows in the <111> direction - it has previously been a challenge to create arbitrarily oriented PZT films that do not crack under mechanical stress. Additional goal in a foundry environment is to do this repeatably and quickly. This has been achieved through using TiO2/Pt/Metal oxide stack as the bottom electrode of the PZT structure. The key is to deposit optimal quality <111>-oriented Pt with the best crystalline structure possible, on which a high-quality <100> metal oxide layer can be deposited. How defect free the Pt-layer forms depends in turn on the quality of the TiO2 layer, which is needed both for adhesion and to prevent Pb from diffusing from the PZT to the silicon substrate. After 1,5 years of process development to improve the quality of both the TiO2, the Pt and the metal oxide, Silex has succeeded in the optimization of this entire stack magnificently. Another factor in the improvements of the e31 coefficient has been doping of PZT. Enhancing the piezoelectric properties of PZT with various dopants has led to another 20 % increase in the e31 coefficient at Silex. With rigorous process development in smart-MEMPHIS, Silex can now grow thick layers of PZT that have excellent qualities for energy harvesting and that do not crack under physical stress. Right now extensive HAST and long time reliability and fatigue testing are on-going at aixACCT with initially very promising results. Silex contributions to PZT development benefit not only energy harvesting, but other future MEMS as well. Piezoelectric materials hold a lot of promise for producing smaller MEMS actuators with better performance and lower power consuption. For instance, EPSON released PZT-based MEMS printer heads already in 2013, and the start-up USound is producing piezo-MEMS loudspeakers. In sensors, such as microphones, accelerometers and gyroscopes, piezomaterials offer better sensitivity, lower voltages and much lower power consumption while being smaller. In actuators, the benefit of piezoelectric materials is their almost immediate response as well as lack of moving parts, which makes piezoelectric actuators very durable. By developing better processes and materials, smart-MEMPHIS contributes to the development of the neverending variety of emerging MEMS products. Posted on September 7, 2016 by Johanna Anteroinen. Smart-MEMPHIS partner Chalmers recently published results on improved materials for supercapacitors. MEMS energy harvesters using piezoelectric materials are compact and have the potential for high-volume production. As the design and optimization of these devices is complex, numerical simulation is a necessary tool in order to obtain high performance. However, an uncritical use of simulation tools may lead to significant inaccuracies. Smart-MEMPHIS was one of the first Horizon 2020 projects to start after the 8th framework programme begun in 2014. After 1.5 years in the daily management and administration of the project, Senior Project Manager Joni Turunen from Spinverse explains what it is like to manage a multi-partner international project and gives his tips for a coordinator still planning a project. During Spring 2016 the first generation ASIC developed within the smart-MEMPHIS EU project was received from the ASIC foundry in Austria, AMS. It has since been tested and characterized. The evaluation board was developed to test the variety of harvesting sources and scenarios intended for the smart-MEMPHIS project. The master class held in rainy Grenoble was attended by nearly 50 people from all over the globe. Posted on June 13, 2016 by Johanna Anteroinen. Eight European companies, research institutes and universities join forces in the smart-MEMPHIS project. The objective of the project is to develop new, autonomous modules for energy harvesting. Energy harvesting systems that are developed within the smart-MEMPHIS project will have many applications ranging from implantable pacemakers to aircrafts. In cardiac pacemakers, the energy generated by heart beats will be used to power the implanted devices, thus bringing significant benefits to patients and healthcare professionals alike. Currently, state-of-the-art pacing systems are implanted under the skin in the patient’s chest. They deliver pacing therapy via insulated wires that are positioned within the heart. In the near future, minimally invasive devices with advanced features will deliver therapy directly within the heart, enhancing patient quality of life (minimal scars, fewer complications related to device replacements, etc.) and reducing healthcare costs. In order to develop these downsized, smart implantable medical devices, researchers must find a solution to the problem of device longevity. Because these types of devices need to be miniaturized in order to fit inside the chambers of the heart, there is limited space available for power sources. In addition, removing implanted systems from inside the heart is complex, so the number of device replacements needs to be limited. A self-powered implantable device would overcome these technological constraints. By developing modules for harvesting the energy generated by heart beats, the smart-MEMPHIS project will address these challenges and improve cardiac patients’ daily lives. The medical device sector is not the only one that will benefit from the expected results of the smart-MEMPHIS project. The energy harvesting system will also be tested in an industrial application: a wireless sensor network for structural health monitoring (SHM). Structural health monitoring is the process of detecting changes in materials or complex structures, for example micro-cracks in aircraft wings. This process currently requires many various sensors to collect data. The smart-MEMPHIS project is developing a wireless sensor network with self-powering acoustic sensor nodes. SHM will increase the safety of the monitored structures as it will identify any tiring, weakening or damage to the structures before they fail catastrophically. The smart-MEMPHIS consortium comprises nine partners across the value chain from universities and research organisations to a MEMS-manufacturer and both medical and industrial end users. The smart-MEMPHIS project started in December 2014 and will run for 3.5 years. 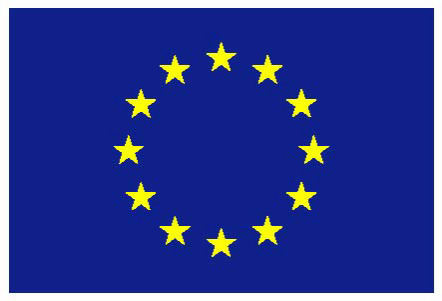 The project is entirely funded by the European Union under the Horizon 2020 Framework programme with a budget of EURO 8.2 million. The project is coordinated by the Swedish SME Silex Microsystems AB. Other partners include Acreo Swedish ICT, Chalmers Technical University and Linköping University from Sweden; Sorin CRM SAS and Vermon SA from France; Fraunhofer IZM and aixACCT Systems GmbH from Germany; and Spinverse Oy from Finland. Posted on March 13, 2015 by Johanna Anteroinen and filed under News.